A supposed sect of an Essene order, among Palestinian Jews of the second century. The only passage in which the name occurs is Miḳwaot ix. 6 (Tosef. ib. vi. 14 [vii. 1]), where the following Halakah is recorded by a tanna of the middle of the second century, concerning the question of dipping the clothing for Levitical purification: "Garments belonging to the Bannaim may not have a mud-stain even upon one side, because these people are very particular concerning the cleanliness of their clothing, and any such spot would prevent the purifying water from actually penetrating the garment as it is usually worn; but with a 'bor' [explained as an unlearned and uncultured man], it matters not if his clothing contain a mud-spot at the time of dipping, for such a one is not so particular about cleanliness." The identity of these Bannaim was lost to the amoraim of a century later. Hence the term was explained as "scholars who occupy themselves with the study of the world's construction"; so that "Bannaim" would mean "building-masters" or "building-students," from "banah" (to build) (Shab. 114a). Similarly to this explanation, Frankel (see below) understood the Bannaim to be an Essene order who were employed with ax and shovel (compare Josephus, "B. J." ii. 8, § 9); while other scholars, such as Sachs and Derenbourg ("Essai sur l'Histoire de la Géographie de la Palestine," p. 166), agree in the main with Frankel, but explain "Bannaim" to mean "those who bathe," from the Judæo-Aramean word "banna'a," equivalent to the Greek βαλανεîον (bath). Thus the name of this order would then be identical in meaning with the "Ṭobele Shaḥarit" (Hemerobaptists), as the Essenes are sometimes called. 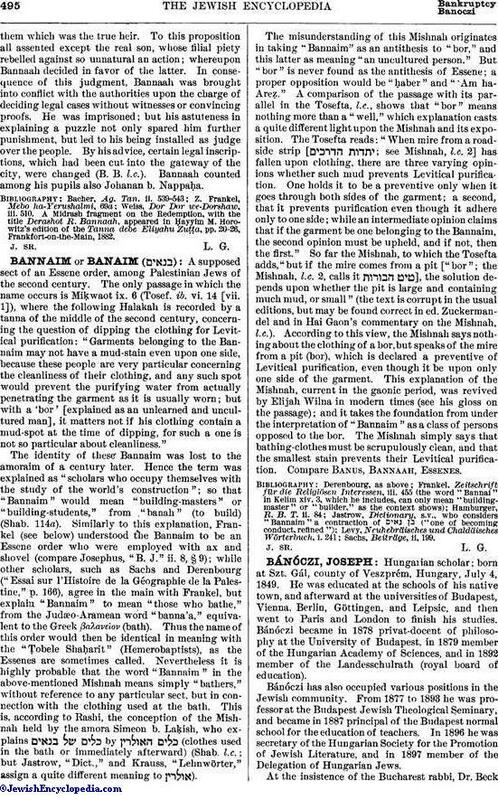 Nevertheless it is highly probable that the word "Bannaim" in the above-mentioned Mishnah means simply "bathers," without reference to any particular sect, but in connection with the clothing used at the bath. This is, according to Rashi, the conception of the Mishnah held by the amora Simeon b. Laḳish, who explains by (clothes used in the bath or immediately afterward) (Shab. l.c. ; but Jastrow, "Dict.," and Krauss, "Lehnwörter," assign a quite different meaning to ). The misunderstanding of this Mishnah originates in taking "Bannaim" as an antithesis to "bor," and this latter as meaning "an uncultured person." But "bor" is never found as the antithesis of Essene; a proper opposition would be "ḥaber" and "'Am ha-Areẓ." A comparison of the passage with its parallel in the Tosefta, l.c., shows that "bor" means nothing more than a "well," which explanation casts a quite different light upon the Mishnah and its exposition. The Tosefta reads: "When mire from a roadside strip [ ; see Mishnah, l.c. 2] has fallen upon clothing, there are three varying opinions whether such mud prevents Levitical purification. One holds it to be a preventive only when it goes through both sides of the garment; a second, that it prevents purification even though it adhere only to one side; while an intermediate opinion claims that if the garment be one belonging to the Bannaim, the second opinion must be upheld, and if not, then the first." So far the Mishnah, to which the Tosefta adds, "but if the mire comes from a pit ["bor"; the Mishnah, l.c. 2, calls it ], the solution depends upon whether the pit is large and containing much mud, or small" (the text is corrupt in the usual editions, but may be found correct in ed. Zuckermandel and in Hai Gaon's commentary on the Mishnah, l.c.). According to this view, the Mishnah says nothing about the clothing of a bor, but speaks of the mire from a pit (bor), which is declared a preventive of Levitical purification, even though it be upon only one side of the garment. This explanation of the Mishnah, current in the gaonic period, was revived by Elijah Wilna in modern times (see his gloss on the passage); and it takes the foundation from under the interpretation of "Bannaim" as a class of persons opposed to the bor. The Mishnah simply says that bathing-clothes must be scrupulously clean, and that the smallest stain prevents their Levitical purification. Compare Banus, Bannaah, Essenes.